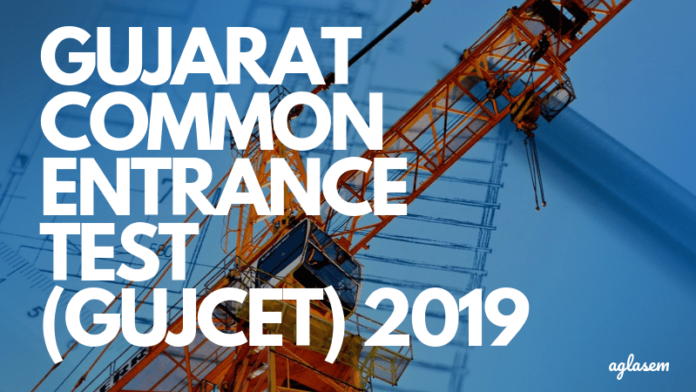 GUJCET 2019 – GSEB has released the admit card for GUJCET 2019. The candidates can download it online at gsebht.in. GUJCET 2019 exam date was rescheduled to April 26, 2019, due to general elections. Gujarat Common Entrance Test (GUJCET) is a state level entrance exam which is conducted by Gujarat by Gujarat Secondary and Higher Education Board (GSEB). It is a pen-paper based tets held to offer admission into BE/BTech and pharmacy (degree/diploma) courses. The test consists of MCQ type questions from Physics, Chemistry, Biology/ Mathematics section. Check more details on GUJCET 2019 from this page. Latest: GUJCET 2019 Admit Card released. Download here. 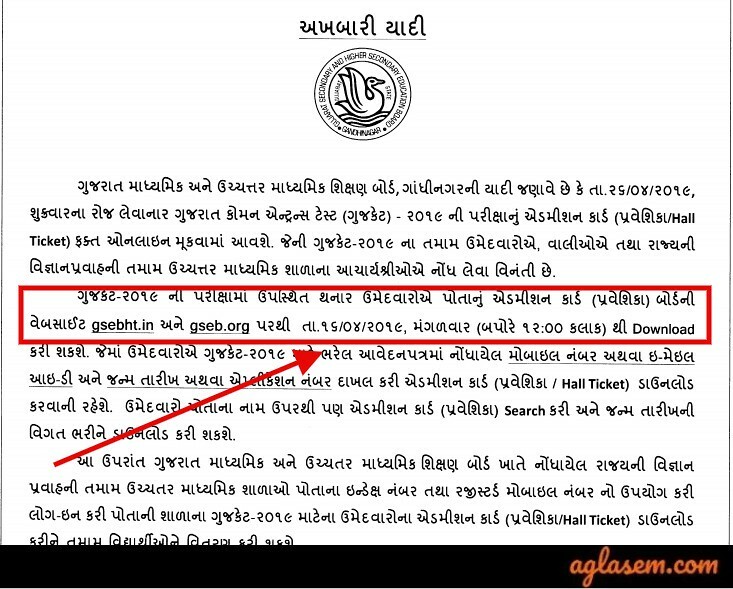 As per the recent press note, made available on the official website of GUJCET 2019, the release date of admit card has been confirmed. GSEB releases GUJCET 2019 admit card on its official website on April 16, 2019. Gujarat Secondary and Higher Education Board had released the admit card of GUJCET on its website, gseb.org. GSEB issues the admit card only in online mode. A candidate appearing for the GUJCET 2019 must download the admit card by providing their login details. 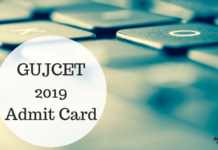 Details like registered email or mobile number and date of birth or application number are needed to download GUJCET 2019 Admit Card. 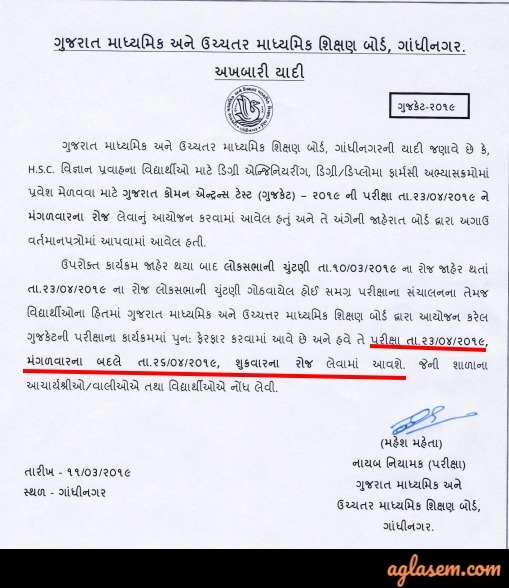 If a candidate doesn’t receive GUJCET Admit Card at least 3 days prior to the exam, he or she must contact the authorities over the helpline number. The admit card has all the information regarding the candidates and the exam, therefore it is an important document to be carried by every candidate taking the exam. The exam pattern of GUJCET is as provided below. Candidates appearing for GUJCET 2019 will be advised to prepare as per the prescribed syllabus and exam pattern. Marking Scheme – 1 mark for every correct answer and -0.25 marks shall be deducted for every wrong answer. GSEB has prescribed the GUJCET Syllabus. For GUJCET Engineering courses, a candidate will be required to prepare Physics, Chemistry and Mathematics subject important topics. Candidates appearing for GUJCET 2019 will be required to cover or prepare all these important topics. Soon after the examination, the board releases the official answer key for GUJCET 2019 on its website. 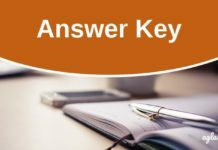 The answer key will be a great help to the candidates who appears for the GUJCET. Candidates will be able to estimate their chances of qualifying for the exam or to get into one of its member engineering or pharmacy colleges. With the help of the marking scheme and the answer key, a candidate will be able to cross check the responses that a candidate had provided. A candidate might not be able to know their exact GUJCET 2019 but will get to know whether they have qualified for GUJCET, this year or not. Once the authorities have conducted GUJCET 2019 and released the answer key for the exam the result is announced. GUJCET 2019 Result/ Merit list is announced in the month of May or June. In the result prepared by the GSEB candidates will be able to know their overall scores, along with the section wise marks. Further, on this basis, the authorities will be preparing and releasing the GUJCET 2019 merit list. The higher the mark secured by a candidate, the sooner his or her name will feature in the merit list. The authorities are expected to release separate category wise, subject wise merit lists. On this basis, a candidate will also be called for the final round of counselling. The final round of admission for GUJCET 2019 is the counselling. However, GSEB will not be the conducting body for GUJCET counselling process. Admission Committee for Professional Courses (ACPC ) will conduct the counselling round of the selected candidates as per the merit list. Documents like GUJCET 2019 admit card, mark sheets of Class 10 & 12, migration or transfer certificate, GUJCET 2019 scorecard, passport size photographs and category certificate(if needed) will be required to be carried to the allotted center at an allotted date and time. Note: Candidates missing to appear for this round will not be invited again to appear. Their candidature will also be cancelled. Before applying for the exam, a candidate will be required to fulfil the following eligibility criteria, as laid down by the concerned authorities. A candidate must be a resident of Gujarat. Also, candidates residing outside Gujarat but who were earlier a resident of Gujarat are eligible for admission. Should have passed his or her Class 12 or equivalent level of education. Also, candidates who will be appearing for 10+2 level of exam will also be eligible to appear for GUJCET 2019. Should have secured a minimum of 45% of marks(40% of marks in case of candidate belonging to a reserved category) only then will be eligible for appearing in this exam. GUJCET 2019 Application Process- Over! The registration for GUJCET 2019 is now over. To apply, the candidates have to first register by entering basic details like Surname, Students Name, Guardian Name, Gender, Mobile Number, E-mail Id, Confirm E-Mail Id, Password, Confirm Password. Once registered, the candidates need to pay the application fee and then fill details in the application form. Other than the details, candidates will also have to upload the photograph and signature in the application form of the exam. Application Fee: To successfully register for GUJCET 2019, the aspirants need to pay the registration and examination fee of Rs. 300. The aspirants can pay the given amount by Online mode using Credit Card/ Debit Card/ Net Banking. Due to the elections, the GSEB board has notified the change in exam date of the common entrance exam. From April 23, 209 the exam date has been moved to April 26, 2019. Earlier due to the clash of dates with the Board exams the exam date was changed. It is modified for the third time now. 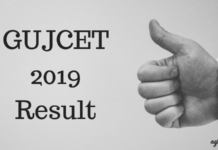 GUJCET 2019 Result – Check The Result And Merit List From Here! GUJCET 2019 Answer Key – Estimate Your Scores From Here!